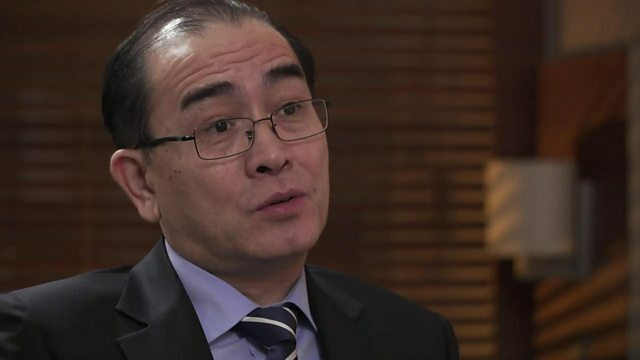 An interview with Thae Yong-ho, formerly a diplomat for Pyongyang in London, who in August 2016 became one of the highest-ranking officials ever to defect from North Korea. Browse content similar to The North Korean Defector. Check below for episodes and series from the same categories and more! inside my family. At that time I thought my sons deserve the truth. really, you know, a question which I do not like to even think about. only my family members but the whole North Korean people from slavery. outside say there is a prison camp system in North Korea, Gulag system. American administration should not fall in this trap. Don't do deals? North Korea should give up the nuclear weapons programme itself. is he capable of pressing that Hutton and destroying Los Angeles? Kim Jong-un insight North Korean society. He rules by fear, clearly. going isn't there? Explained this complexity. were possible. What do you think of that? I think that is unlikely. of Kim Jong-un. Myself, I've never seen car, even, in Pyonyang city. office, where is his house, no. He is a kind of leader in the air. Hall to watch Eric Clapton, I can see the tears, even, in his eyes. important people. He is only interested in music. Eric Clapton. making money for the regime, or raising money for the regime? In August 2016, Thae Yong-ho became one of the highest-ranking officials ever to defect from North Korea. He had been a diplomat for Pyongyang in London. The BBC's Korea correspondent Stephen Evans met him several times then, and in January 2017 conducted a wide-ranging interview with him in Seoul.